It's taken years, but today I am happy to announce that the Converse Weapon will be available on Converse One. If you don't know, Converse One is the program in which Converse shoes can be customized. You'll find that the page works the same as Nike Id. The Weapons won't be available until the fall, but they went ahead and put up the option so people will know. Which is why I am telling you today. You will be able to customize both the mid and ox versions of the Weapons. However, that's not all. The Pro Leathers will also be up on Converse One. They will be for sale sometime this summer, in hi and low versions. 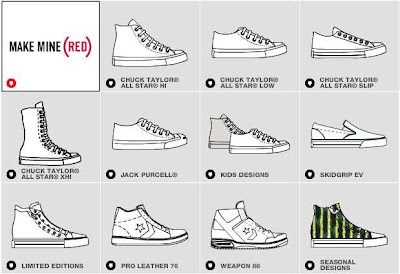 Also there will be limited edition Chuck prints, double upper Chucks, seasonal chuck prints, and another Chevron and Star shoe called the Premiere Player. I can't tell you how excited I am about these developments. I had heard that there would be a classic basketball shoe up soon, but I had no idea there would be both Weapons and Pro Leathers. Thanks for checking out the blog. I am out early today, for some reason I decided not to sleep last night. Don't forget to vote in the poll, only a few days left. that's awesome!! at the same time, I feel a little betrayed, because I recently e-mailed Converse about where to find Weapons and if they were planning to offer customizable Weapons any time soon and they said no!